IT'S A LIE! SAYS PAUL D. COX! 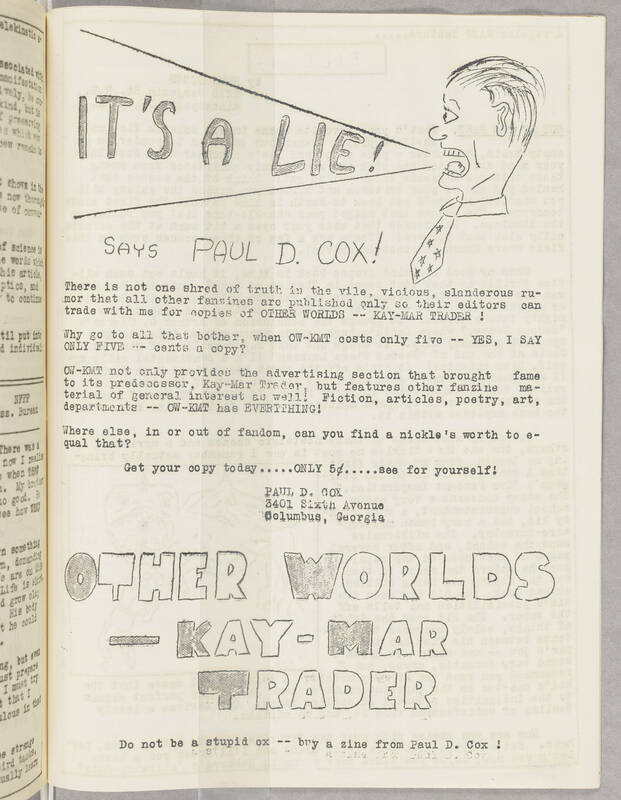 There is not one shred of truth in the vile, vicious, slanderous rumor that all other fanzines are published only so their editors can trade with me for copies of OTHER WORLDS -- KAY-MAR TRADER ! Why go to all that bother, when OW-KMT costs only five -- YES, I SAY ONLY FIVE -- cents a copy? OW-KMT not only provides the advertising section that brought fame to its predecessor, Kay-Mar Trader, but features other fanzine material of general interest as well! Fiction, articles, poetry, art, departments -- OW-KMT has EVERYTHING! Where else in or out of fandom, can you find a nickel's worth to equal that? Get your copy today.....ONLY 5[[cent symbol]].....see for yourself! PAUL D. COX 3401 Sixth Avenue Columbus, Georgia OTHER WORLDS -KAY-MAR TRADER Do not be a stupid ox -- buy a zine from Paul D. Cox !